A lack of support for the censure motion from other parties, less than a month after the legislature endorsed the appointment of Juncker’s 28-strong executive team, makes it highly improbable that his critics will win the two-thirds majority required to force the Commission from office. Such an event would be unprecedented. Parliament has no power to sanction individual members of the executive. An alliance of Eurosceptics, including Britain’s UK Independence Party, the French National Front and Italy’s 5-Star Movement gathered 76 signatures to meet the threshold of 10% of the 751-seat chamber to put the motion on the agenda. The motion was tabled by the Europe of Freedom and Direct Democracy Group in the European Parliament, which is led by UKIP leader Nigel Farage. It stated that Juncker, who was Luxembourg’s prime minister for two decades until a year ago, was directly responsible for tax policies which are now under investigation by the Commission for unfairly attracting multinational businesses. Eurozone countries have had to slash spending and hike taxes to counter government debt crises in the past few years, heightening public resentment of schemes that help wealthy individuals and companies to pay less tax. “A person who is responsible for the creation, the implementation, the governance and the monitoring of these aggressive tax avoidance policies does not have the credibility to serve the European citizens as President of the European Commission,” the motion read. “The LuxLeaks scandal shows that Commission President Juncker in his political life has always acted to enrich his country behind its European partners, in defiance of the Union and the Community spirit he hopes to represent,” commented 5 Star Movement MEP Marco Zanni. “This motion of censure means there must now be a debate on the behaviour of President Juncker and a vote to remove the entire European Commission,” added UKIP MEP Steven Woolfe. Juncker has said he wants a level playing field in corporate taxation. The censure motion, brought by parties that oppose EU oversight over states, said “tax sovereignty” was vital for competition but Luxembourg’s policies were not fair competition. Eurosceptics won a bigger voice in parliament at elections in May amid growing disillusionment with economic austerity and perceived failures of European Union administration. They have complained of a “grand coalition” of mainstream parties backing Juncker and trying to suppress minority views in parliament. A previous attempt by the Parliament’s Leftist group GUE/NGL failed to obtain the required number of signatures. The MEPs said at the time they will not accept far-right MEPs who wish to join their initiative. Liberal Democrat MEP Catherine Bearder criticised the initiative by the EFDD group in Parliament, saying UKIP leader Nigel Farage broke earlier promises. "Nigel Farage promised UKIP would not 'get into bed' with Marine Le Pen and the French National Front. Yet that is exactly what UKIP have done by co-signing this motion with them. "Instead of this opportunist grandstanding, the EU needs a proper independent investigation into the allegations against Juncker and his possible involvement in tax evasion." 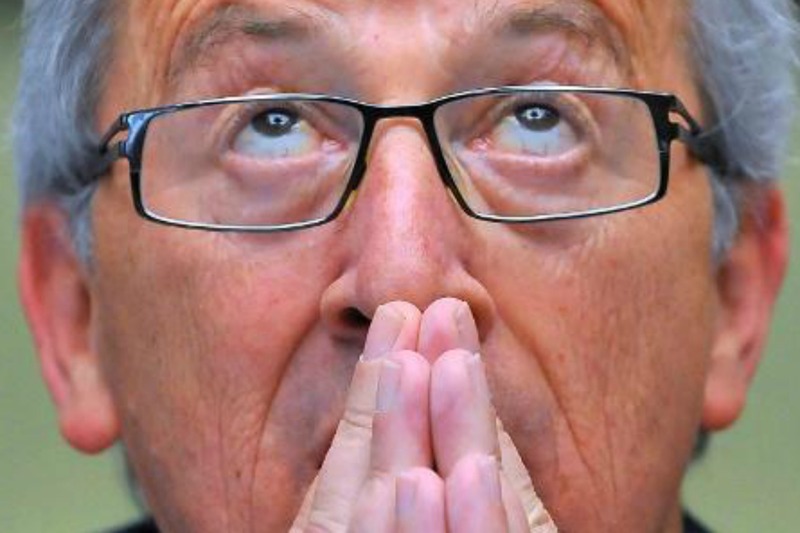 The Luxleaks scandal erupted on 5 November 2014, when the International Consortium of Investigative Journalists (ICIJ) uncovered "industrial scale" tax evasion in Luxembourg at the time when Jean-Claude Juncker was prime minister of the Grand Duchy. The investigation was based on a review of nearly 28,000 pages of confidential documents, which reveal that more than 300 international companies have channeled hundreds of billions of dollars through Luxembourg and saved billions of dollars in taxes. Juncker, who is now President of the European Commission, rejects all accusations of masterminding corporate tax evasion as Prime Minister of Luxembourg and announced a new EU initiative to clamp down on tax avoidance. Juncker says the tax deals were not illegal and that he will not prevent the commissioner responsible for Competition, Margrethe Vestager, from doing her job in investigating the four cases opened so far (two in Luxembourg, one in the Netherlands and one in Ireland). EURACTIV Greece: ?? ?????? ?????? ?? ???????????????? ????????? ???????? ?????? ???? ??? ???????? Juncker wants a level playing field in corporate taxation (Meaning: Corporates pay no taxes anywhere). Comment to those that brought the motion: “fair competition” is an oxymoron. Suggestion: bring the motion (or a variation thereof) every month for as long at Tax-dodgers-R-Us is in office. Junker out, out, out. PS: it is good to see the Euro-socialists supporting a tax-dodger – well done chaps – we now fully understand whose side you are on. member-states are in fact self-destructing itself the tax competitions .. unless an european constitutional tax protection is implemented despite Juncker in or out the commission ! Media can talk about the Juncker or moral all the time but the core issue will remain and ignored by Council ! This E.U. is a coward piece of junk ! That’s why your idea of Federal Europe is not a good one! We need a centralised Europe, in which the notion of Nation-State is scrapped for good. Those who disagree are enemies of mankind. And should therefore be prosecuted by the ECtHR.